Which transmission route is most important for influenza? “We are no more in the aerosol camp than the contact camp” conclude the authors. And this seems to be how it is in terms of influenza transmission routes – you’re either in one camp or the other. This 2010 PLoS Computational Biology paper is hardly hot off the press, but it is important and it does, to an extent, put the question of which camp you are in for influenza transmission to bed: you need to pitch your tent in different camps depending on the circumstances. The paper describes a model to compare the various transmission routes for influenza, principally airborne, droplet and contact. The study evaluates four transmission routes: ‘respirable particles’ (<10 µm), ‘inspirable particles’ (>10 µm, <100 µm), ‘direct droplet spray’ (>100 µm) and ‘contact’. The model tests 10,000 scenarios, considering possible variation in virus properties, host susceptibility and environmental factors (such as the number of influenza shedders). 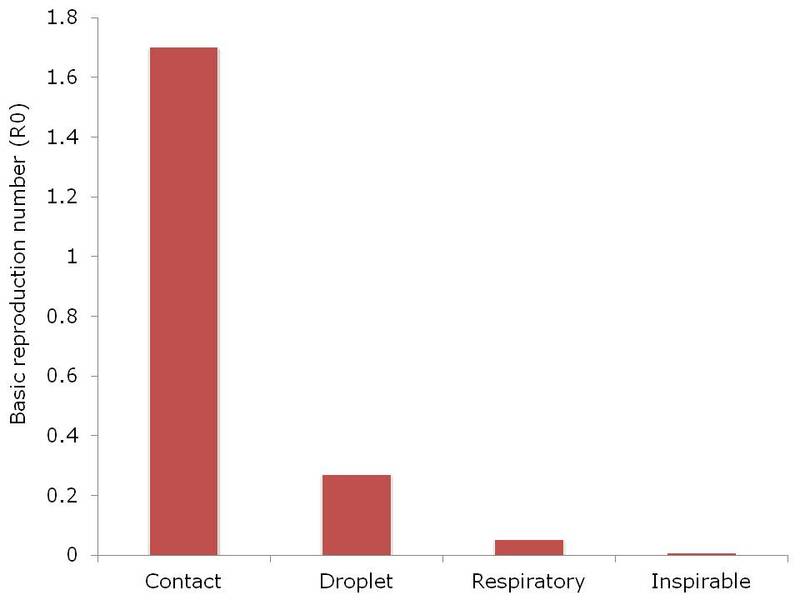 The key finding is that contact transmission had the highest average basic reproduction number (R0) (1.7) followed by droplet (0.27), respirable (0.05) and inspirable (0.006) particles (Figure). However, that is only part of the story. Of the 10,000 scenarios evaluated, contact only was associated with high transmission in 3,069, all four routes in 342 and none in 4,765. In high host density settings, all routes were more frequently important. Conversely, when self-inoculation was more common (i.e. when simulated individuals touched their simulated nose, eyes and mouths more frequently), contact transmission was more important. Figure: Basic reproduction number (R0) of four influenza transmission routes, ‘respirable particles’ (<10 µm), ‘inspirable particles’ (>10 µm, <100 µm), ‘direct droplet spray’ (>100 µm) and ‘contact’. The findings are interesting and probably very important. It’s a shame they were not able to evaluate the relative importance of contact transmission involving contaminated surfaces compared with contact transmission that occurs independent of surface transmission (this has been evaluated elsewhere). Also, I remain suspicious of modeling in general. If simplifying assumptions are too simplistic (which is often the case), the model spits out garbage, which is worse than useless. Put another way, Bertha can produce anything if she’s given the right inputs! 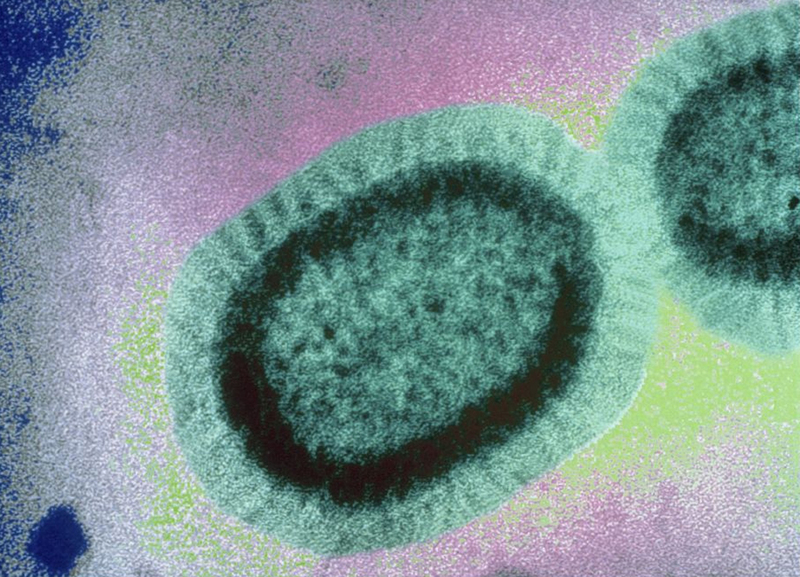 Plus, it’s difficult to know how applicable these findings are to other respiratory viruses. Still, the paper does shed light on the relative importance of influenza transmission routes. Which is most important? Well, that depends on the context. If you’re in a small room, airborne and droplet transmission is key. If you’re admitted to a room following the discharge of a patient with influenza, then contact transmission is key. Hence, we need to be flexible when considering influenza transmission routes and ‘contextualize’ our interventions accordingly. Citation: Spicknall IH, Koopman JS, Nicas M, Pujol JM, Li S, Eisenberg JN. Informing optimal environmental influenza interventions: how the host, agent, and environment alter dominant routes of transmission. PLoS Comput Biol 2010; 6: e1000969.